OAKLAND, Calif. — The Boston Celtics were supposed to be the team that was reeling, fighting inner turmoil and carrying a toxic disposition. But after dismantling the Golden State Warriors 128-95 Tuesday at Oracle Arena, the roles seemingly were reversed. In the home locker room, inhabited by the team on top of the Western Conference standings, chaos ensued during postgame interview sessions. Warriors head coach Steve Kerr kicked things off, saying, “It starts with a passion, and an anger and an intensity, and it wasn’t there tonight.” The Warriors (44-20) lacked focus out of the gate, falling behind 11-0, and committed a season-high 22 turnovers. When Kevin Durant was told about Kerr’s use of the word “anger” to describe what was missing from the team, the back-to-back Finals MVP dismissed his coach’s assertion. During that display, it was impossible not to conclude that Durant intentionally took a swipe at his coach. The individuals in the room were stunned with his comments. From the moment Durant took his seat, his demeanor was of someone prepared to go on the attack. While asking a softball question, a reporter made the mistake of starting it off by reminding Durant that one of the reasons he signed with the Warriors was because of defensive-guru assistant Ron Adams. But before the question could be fully relayed, Durant promptly interrupted. “We’re still talking about me coming here?” he asked with annoyance. The reporter respectfully explained that the question wasn’t about his free-agency decision from three years ago, but rather about how Adams might be dealing with the way his defense is struggling right now. Durant’s postgame session lasted for only two minutes, but it stole the evening. It was the talk of the night and it will surely dominate sports-talk shows on Wednesday. The Warriors scored 99 or fewer points for the seventh time this season and are now 0-7 in such games. Celtics star Kyrie Irving, who has been in a foul mood the last few weeks and short with the media in recent games, was in a surprisingly buoyant state after the blowout victory. He listened, smiled and thoughtfully and eloquently answered each question without any hint of disdain. Those who follow the Celtics (39-26) daily said they haven’t seen this side of Irving since the All-Star break. 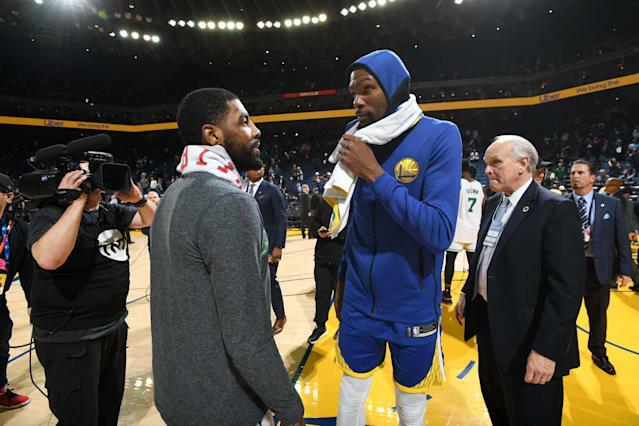 Irving and Durant are close friends who both happen to be hitting free agency this summer. They have been linked to the New York Knicks, and both have been combative at times this season with teammates and members of the media. There are members of the organization concerned that Durant’s behavior is a sign that he’s already got one foot out the door. But there are others who aren’t reading too much into what they consider to be the standard rigors and annoyances of an 82-game season. Nevertheless, of these two squads, only one’s fanbase was able to let out a collective sigh of relief. And it wasn’t the one that was expected to.